ATLANTA, Georgia (CNN) -- Vernon "the Viper" Forrest was competitive, not merely in his title bouts as a boxing champion but in video games and card games as well, friends say. Boxing champ Vernon Forrest, seen in September, was killed Saturday near an Atlanta gas station. His longtime friend and manager, Charles Watson, said it may have been that competitive spirit that led Forrest to chase a wallet snatcher Saturday night in Atlanta, a pursuit that ultimately ended in Forrest's death. "He got caught up in that competitiveness and chased the guy," Watson said. "Sometimes your strengths turn out to be your Achilles' heel." It wasn't that Forrest wasn't generous -- he amply shared his time and fortune -- but he liked helping people on his own terms, whether it was letting up-and-coming boxers stay at his house, paying for youngsters with disabilities to go to their proms or postponing his workouts to attend his trainer's daughter's soccer games. The Fulton County Medical Examiner's Office ruled his death a homicide and reported that Forrest, a 38-year-old father of one, died of multiple gunshot wounds to the torso and thigh. A former welterweight and light middleweight champion, Forrest is the third boxer to die this month: Alexis Arguello died in Managua, Nicaragua, from an apparent self-inflicted gunshot wound to the chest July 1, and Arturo Gatti was strangled at a Brazilian resort July 11. Watson said Forrest was returning from the gym after a late workout Saturday. His godson, visiting from Houston, Texas, needed to use the restroom, and Forrest stopped at a Southwest Atlanta gas station, Watson said. Forrest told the youngster to get a Snickers bar and a bottle of Gatorade. While Forrest put air in the back tire of his Jaguar, a man snatched his wallet out of his hand after asking him for money, said Watson, who spoke to police and the godson. Forrest's funeral is scheduled for Monday in Lithonia, Georgia, Watson said. Buddy McGirt, who trained both Gatti and Forrest, began working with Forrest about two years ago. McGirt says he spoke last week to Forrest, who said he wanted to start training August 1 to get his weight down for a potential fight on the Floyd Mayweather-Juan Manuel Marquez card in September. McGirt described Forrest as a "big kid" who stashed fruit candies in the gym closet and played spades late into the night when he was training. He also loved bowling and video games, especially "NBA Live." "If you beat Vernon, you were staying," McGirt said, explaining how the champ hated to lose. "At the same time, you couldn't let him beat you. You wouldn't hear the end of it." Forrest's resolve permeated his training, McGirt said. Even when Forrest was in a bad mood -- a common occurrence among fighters trying to make weight -- he gave 100 percent. Sometimes, McGirt said, he would need to make Forrest laugh, a fairly easy task, before the two could begin their drills. Holyfield described Forrest as a driven, confident, "outstanding boxer" who worked diligently to refine his skills. Holyfield said he remembers watching Forrest spar at Holyfield's gym in the mid-1990s. His sparring partner was Pernell Whitaker, who had won belts in four different weight classes during his career. Whitaker, one of Holyfield's teammates on the 1984 Olympics team, was one of the best fighters Holyfield had ever witnessed. "It was no joke that this man was the best. Pernell and I were in the Olympics together, and I'd never seen nobody who could go with Pernell," Holyfield said. "The only guy who could go with him was Vernon Forrest." Forrest always came to the gym ready to work. He'd cue up some hip-hop music -- so loudly that McGirt would warn adjacent businesses when Forrest was training -- and start his workouts. "He never disputed anything I asked him to do, no matter how tired he was," McGirt said. Forrest also never let his boxing titles go to his head. His demeanor outside the ropes was the antithesis of his attitude between them, and in a sport known more for its unsavory characters than for its philanthropists, Forrest was one of the good guys, his friends said. If another boxer was sparring or working the speed bags, Forrest would say, "Let the other guys work out. I'll start next round," McGirt said. He considered other fighters equals, regardless of belts, as evidenced by an act of kindness last year when Forrest asked McGirt to travel to Atlanta to train him. At the time, McGirt was training a female fighter, Marianne Chubirka, who traveled to Atlanta as well to continue her training. When Forrest heard she was trying to find a place to stay, he called McGirt and told him there was an extra room in his house. "Make yourself at home and clean up after yourself," McGirt remembers him telling Chubirka. The two became fast friends, the trainer said. It didn't hurt that she enjoyed playing spades. Forrest had a "soft spot for kids" as well. In 1997, he helped found Destiny's Child, an Atlanta-based charity that houses children and adults with developmental disabilities and teaches them how to be independent. The charity's impetus came when Forrest witnessed an autistic child struggling mightily to tie his shoe, Watson said. Forrest had a torn rotator cuff at the time and had been griping that he couldn't train, but when he saw the autistic child, he said, " 'Here I am complaining because I can't fight right now because of this injury, and here these people can't do the essential things for life,' " Watson said. "It just tore him up." He didn't simply put his name behind the charity. He personally took the kids to the mall, the water park and Six Flags. He once rented a limo and tuxedos and sent two of them to the prom. He later told HBO, "I didn't get a chance to go to the prom, so I was kind of reliving it through them." In 2002, he took about 10 of them to Las Vegas, Nevada, for his rematch with "Sugar" Shane Mosley, whose undefeated streak Forrest had snapped a few months earlier. 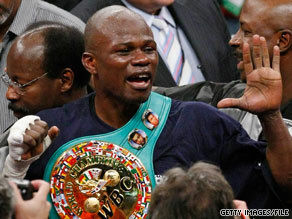 His second win over Mosley would earn him the Boxing Writers' Association of America's 2002 "Fighter of the Year" honor. But rather than prance around the ring spouting braggadocio after his unanimous decision, he rushed into the stands to embrace the youngsters, who called him Uncle Vernon, Watson said. "All the things normal kids had an opportunity to do, he wanted them to do, and he wouldn't take no for an answer," the manager said. Asked how someone so fierce in the ring could be such a softie, Forrest told HBO, "I grew up hard. I'm a mean person. I've been mean. I know how to turn it on and turn it off, like a light switch." Holyfield said Forrest, eight years his minor, sometimes called him soft for not standing up for himself, but Holyfield tried to tell him some fights are better left alone, the former heavyweight champ said. "If he had $1 million and you took one penny, you were going to give his penny back," Holyfield said. "I used to tell him, 'Some people are going to get over on you.' And he said, 'Not on me.' "
As Watson said, one's greatest strength can be a weakness, and those who knew Forrest loved him for the courage and principles that may have led him to his death. "Vernon was the type of guy -- he was his own man," McGirt said. "He told you what he really felt. He didn't pull any punches. That's what I loved about him."